The Treaty of Belgrade, known as the Belgrade peace[a] was the peace treaty signed on September 18, 1739 in Belgrade, Habsburg Kingdom of Serbia (today Serbia), by the Ottoman Empire on one side and the Habsburg Monarchy on the other, that ended the Austro–Turkish War (1737–39). This treaty ended the hostilities of the five-year Austro-Russian–Turkish War (1735–39), in which the Habsburgs joined Imperial Russia in its fight against the Ottomans. 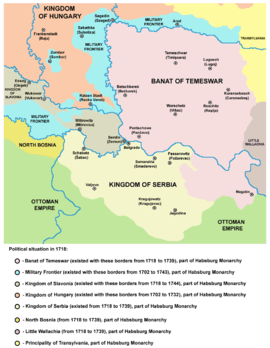 With the Treaty of Belgrade, the Habsburgs ceded the Kingdom of Serbia with Belgrade, the southern part of the Banat of Temeswar and northern Bosnia to the Ottomans, and Oltenia, gained by the Treaty of Passarowitz in 1718, to Wallachia (an Ottoman subject), and set the demarcation line to the rivers Sava and Danube. The Habsburg withdrawal forced Russia to accept peace at the Russo-Turkish War, 1735-1739 with the Treaty of Niš, whereby it was allowed to build a port at Azov, gaining a foothold on the Black Sea. The Treaty of Belgrade effectively ended the Kingdom of Serbia which had existed since 1718. This territory would await the next Habsburg-Ottoman war to be temporarily again included into the Habsburg Monarchy in 1788 with the help of Koča Anđelković. ↑ Treaty of Nis (1739), Alexander Mikaberidze, Conflict and Conquest in the Islamic World: A Historical Encyclopedia, ed. Alexander Mikaberidze, (ABC-CLIO, 2011), 647. ↑ Dennis P. Hupchick, The Balkans:From Constantinople to Communism, (Palgrave Macmillan, 2002), 213. Hochedlinger, Michael (2003). Austria's Wars of Emergence: War, State and Society in the Habsburg Monarchy, 1683-1797. Longman. ISBN 978-0-582-29084-6. Popović, Dušan J. (1950). Србија и Београд од Пожаревачког до Београдског мира, 1718-1739. Regele, Oskar (1954). "Die Schuld des Grafen Reinhard Wilhelm von Neipperg am Belgrader Frieden 1739 und an der Niederlage bei Mollwitz 1741". MÖStA. 7: 373–398. Roider, Karl A. (1972). The Reluctant Ally: Austria's Policy in the Austro-Turkish War, 1737-1739. Louisiana State University Press. ISBN 978-0-8071-0237-4. Roider, Karl A. (1972). "The Perils of Eighteenth-Century Peacemaking: Austria and the Treaty of Belgrade, 1739". Central European History. 5 (3): 195–207. Tupetz, Theodor (1878). "Der Türkenfeldzug von 1739 und der Friede zu Belgrad". Historische Zeitschrift. Oldenbourg Wissenschaftsverlag GmbH. 40 (1): 1–51. Wikimedia Commons has media related to Treaty of Belgrade.